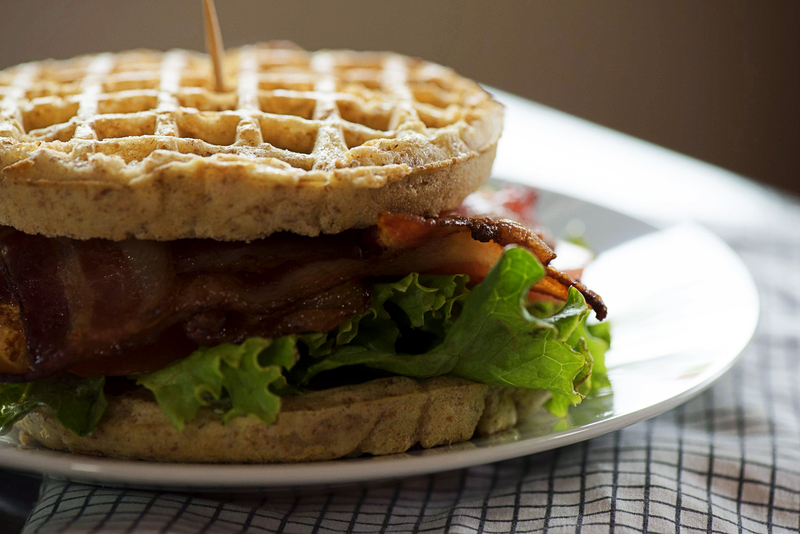 We love a good ol’ fashioned BLT as much as the next person, but we also love…waffles. While the classic lunch sandwich and breakfast staple might not seem like they go together at first, trust us when we say this recipe is ridiculously good. Standard frozen waffles are all you need here, and they add the perfect contrast to the crispy bacon. Speaking of which, the best thing about this sandwich is the fact that we latticed the bacon together, so now you get bacon in every bite and you don’t have to worry about bacon falling out the sides of your sandwich! We’ve all got a package of frozen waffles sitting in the back of our freezer (right? ), so get it out and get ready for a fun, new spin on a classic! Preheat oven to 350º F and line a baking sheet with aluminum foil. Optional: place a baking roasting rack on lined baking sheet. Take 6 half-slices of bacon and place 3 next to each other. Keeping the middle slice in place, lift and fold the tops of the outside slices of bacon onto themselves. Take one of the extra bacon slices (a fourth strip) and lay it horizontally across the middle slice of bacon, then return outside strips to their original, laid-out position. Lift the bottom of the middle slice of bacon and fold it gently over the top horizontal strip of bacon. Take a fifth slice of bacon and lay it horizontally across the outer two slices, then unfold the middle strip so it is lying on top of the horizontal (fifth) slice of bacon. Lift up the bottom of the outer two slices of bacon and lay your last strip of bacon across the middle vertical slice. Unfold outer two slices and you have a completed bacon grid! Repeat with remaining bacon slices, then place on lined baking sheet (or roasting rack). Sprinkle brown sugar over the bacon, if using, and bake for 25 minutes, or until crispy. Prepare waffles according to package directions, then spread mayonnaise lightly on 4 of them. Top with lettuce, thinly sliced tomatoes and bacon grid, then top with 2nd waffle.